Rossiiskoe obschestvo i vyzovy vremeni. Kniga 3 / [Russian Society and Challenges of the Time. Book Three/ M.K. 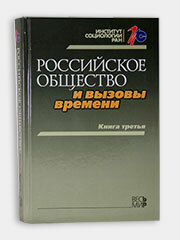 Gorshkov [et al. ]; Ed. By Gorshkov M.K., Tikhonova N.E. Moscow: Izdatelstvo Ves Mir, 2016. 424 p.